With this in mind, would you be surprised that I stuffed it up? Nøgne Ø's Kriek of Telemark unlocked Norway's Here Come the Vikings! (Level 4), although it was two weeks before when I intended to drink it... (I may have been drunk). Anyway - it's a superb Kriek, brewed with naturally sour Norwegian Cherries. The first of the consecutive beers was Wychwood Black Wych. It was a light bodied English Porter from Witney, near Oxford. It had the distinctive chocolate dominating roast flavour, with a touch of caramel, that so characterizes English Porter's. There were some light floral hops, accompanying some slightly stronger than usual carbonation. It's not a world beater, but a nice example of the style. God Save the Queen (Level 34) was the reason you're reading about it. Scottish beers, somewhat strangely, still count towards the God Save the Queen badge even though they now have their own badge; Highlander. (Level 5) of this badge was unlocked by BrewDog's Ace of Simcoe, a single hop Session IPA. It's very easy drinking and has all the Simcoe characteristics you'd expect; Mango, Pine & Grapefruit. The malt base is lightly toasty, but doesn't have much substance to it. After watching the To Øl Craftwerk video 6 or so weeks ago; I thought why don't I drink more To Øl beers. Since then I've had 4 of their beers and I've been impressed with all of them. First Frontier IPA was the beer that unlocked Danish Delight (Level 6). This beer was no exception, there was a light caramel base but the major flavour was of grapefruit hops with a bit of pine. It was slightly over carbonated, but that didn't effect the overall experience too much. It's a lovely American IPA and one that I'd recommend getting your hands on. I honestly had no idea that The Full Irish from 8 Degrees Brewing was still in the back of my fridge. It's a single malt IPA, and works in much the same way as a single hop IPA would except with 100% Irish malt. It'd held up remarkably well considering it was god knows how old. There was a touch of pine hops, which I'm sure would've been stronger had the beer been fresher, and there was nice maltiness. Luck of the Irish (Level 2) was the regional badge, while it coincidentally also unlocked Hopped Up (Level 46). Going Dutch (Level 4) was unlocked by Emelisse's Black Berry. It's a beer that came with a pretty poor reputation, but I honestly couldn't understand why. I thought the blackberry flavour was very impressive, with nice fruitiness and that inherent tartness of blackberries. Despite this tartness it was also quite sweet. The only thing I can think of is that tart-yet-sweet flavour has put some other people off, for mine it was quite an enjoyable beer. One of the badges I unlocked for the first time was Brew of the Dragon, the badge for drinking Chinese beers. Lao Te was the beer that did the job. It's a beer that is apparently brewed with 100% Australian malted barley, not that you could taste any of it in the beer! That said the beer wasn't too bad as Asian lagers go. There wasn't that usual overt sweetness and there was even a touch of grassy/straw-like hop bitterness. As a beer to drink with dumplings you could do much worse, as one for the connoisseurs it's not so good. 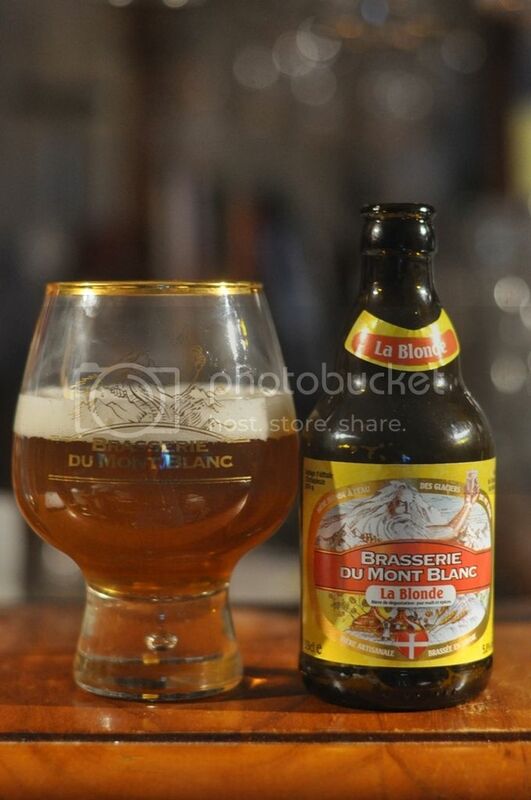 Brasserie du Mont Blanc make one of my favourite beer glasses. Naturally when I came across their La Blonde, I had to try my glass out. It's a perfectly serviceable Blonde Ale, with light Belgian funk, mixing nicely with some reasonably bitter citrus hops. It's a beer that just screams warm spring afternoons. La Creme de la Creme (Level 4), incidentally the first level of this badge I've unlocked outside France, is the reason you're hearing about it. Poland is a country best known for cheap lager and good vodka. When I came across the Brok Extra Stout, I knew this had to be the beer to unlock the new Polish badge; Pole Position. Over the 2 weeks prior, I forced my way through 4 Polish lagers, some of which were actually alright, and then cracked into this beer. The Extra Stout was a really unusual beer. It tasted more like a herbal tonic than a beer. It had this weird malty/cola, almost sarsaparilla, flavour with some other dark fruits that I couldn't place. It's certainly not a stout, maybe a Belgian Dark Ale. It's definitely worth trying, although I won't be rushing back to try it again. Japan is a country who produce excellent craft beer. Unfortunately not that much of it makes it our way. Lizzie picked up Niigata's Canadian Pilsner at the Japanese grocery store that we sometimes get sushi from. It came in a blue glass bottle that I thought was pretty cool. Unfortunately that's where the positives ended. It was a very murky looking beer, not something normally associated with a Pilsner. The flavour was very yeast dominant, it tasted like Vegemite, which again isn't something I'm keen on in a beer... I know Japan does better stuff than this, it might take me visiting to find it though! Rising Sun (Level 5) was the badge. The beer I was most looking forward to in these 17 beers unlocked The Gondolier (Level 12). That beer was Duchessic Ale, a (sort of) collaboration between Birra del Borgo and Cantillon. Duchessic Ale is Birra del Borgo's Duchessa, a delicious fruity saison, that has had 20% 1 year old Cantillon lambic spliced into it. The result is this lovely sour saison, which is full of lemon and hay. I've tried both of the beers used to create this beer individually and can safely say that the combination is far better than either of it's individual parts. Belgian Holiday (Level 29) was unlocked by Westvleteren 8. The Westvleteren 8 is probably the least well known of their beers. It's a Dubbel and one that I hadn't had the pleasure of trying before. It's a wonderful complex Dubbel, with this lovely mix of caramel malts, some spices, dark fruits, banana and a hint of bubblegum. It's a wonderful beer but considering the price, I think I'd rather have a 6-pack of the St Bernardus, which is brewed to the same recipe. Trappist Travesty (Level 3) was a nice little added bonus. I am thrilled to be getting so many Omnipollo beers in Australia now! They always deliver the goods and it was their Noa Pecan Mud Cake Stout, the double barrel aged version to be precise, that unlocked Swedish Brews (Level 3). This beer certainly lived up to the hype; in fact I would say it's one of the best beers I've had this year! It's got a big chocolate body with a reasonable amount of vanilla. Despite this the beer isn't overly sweet and there is a nice, although not overpowering, level of whisky influence. A beer that I've had in the back of my cupboard for years unlocked the new badge for drinking African beers; Going on Safari. That beer, thankfully, was one that could hold up to the rigours of time. The beer was the Urbock from Namibia Breweries Limited, a 7% Bock that had held up magnificently! There's plenty of sweetness from something that smells like honey and some malts that have caramel and roasty characteristics. The mouthfeel was creamy and the beer drank beautifully. It also unlocked Wheel of Styles (Level 17). When I was first getting into craft beer Unibroue's beers were available pretty readily at craft beer shops. Within maybe a year they had all but disappeared; so it was with much surprise that I stumbled upon a Trois Pistoles about a month ago. This is a Belgian Strong Dark Ale packed full of candi sugar, dark fruits and spices. In my opinion it's one of the best in it's style and is certainly one to seek out! The Great White North (Level 4), the Canadian badge, is why you're hearing about it now. Of all the Russian beers Anton has brought out my favourite has been a Russian Imperial Stout from Victory Art Brew. One of the latest to hit Tru Bru is a new RIS from Victory Art Brew; Pyotr. The beer had plenty of oatmeal, and it's associated creaminess, as well as a light smokiness. The overall taste of the beer was on the sweeter side, but not cloyingly so. I had no idea it was 11% until I looked at the bottle later... This beer unlocked Tovarisch! (Level 4), and Sky's the Limit (Level 20) as an added bonus. Rounding out the 17 country badges was Czech it Out (Level 2), naturally for drinking beers from the Czech republic. The beer was fittingly a classic Czech Pilsner; Kozel Svetly. While not a stand out beer for the style it's very pleasant and easy drinking. It's got a light Pilsner malt base with just a touch of hay thrown in for good measure. The hops are where the beer shines, with the nice spicy grass flavours of Saaz hops providing nice bitterness. It's crisp, finishes quite dry and at 4% you could drink them all day. This is a beer your non-craft drinking mates could easily drink this summer, whilst providing enough interest for a discerning palate. It's fair to say that I missed my deadline of Thursday (almost two weeks ago!). The extravaganza that is my Grand Final Day celebrations got a little out of hand and then I needed to catchup on some uni work. Well done if you got all the way through this review, it was quite a long one... I've got a short Untappd Catchup, which I'm hoping to get done in the next day or so, and a 3rd installment of The Thirst in the pipeline. It's been over two months since I've reviewed a beer in full - so that's something I'm hoping to change soon.